Have you ever had a life changing moment where you are so overwhelmed on many different levels of emotion that it is hard to put it down in words? I have experienced this only rarely in my lifetime. When discovering the tiny island of Kea in Greece through the eyes of Aglaia and Costas of Keartisanal, climbing up pinnacles of rocks to ancient monasteries in the Meteora region in Greece, driving along the Cinque de Terre in Italy at 18, staying at a converted convent on the Coast of the Gods in Tropea, Italy with an active volcano as my view across the expanse of a cerulean blue sea. These are life changing moments than can never be forgotten. However, life changing moments can also be found in the simple things in life. When I attend any type of event I have always taken hundreds, if not thousands, of photos. My third eye is my camera lens and through it I see the world through rose coloured glasses. Long before blogging I was taking photos of the food at my table while on even the smallest of adventures. There’s something so evocative to me about pictures of food and the power they have to vividly remind me of mouth-watering meals and moments that I’ve had on my travels. I can look at my culinary photos and remember exactly where I was, the scent of the dish placed in front of me, and the way the flavours opened up on my palate. In many cases the taste or smell of something in my past is capable of painting a picture with richer, deeper brush strokes than any snapshot in my photo album. In some small way I hope today to take you along for a few moments on this journey hand in hand. I remember my first long table dinner in San Francisco at the now defunct Foodbuzz Festival hosted by Outstanding in the Field. They are the grandaddy by which all long table dinners must live up to, not only in my own mind but by the creation of the ultimate experience. Imagine two hundred and fifty diners sipping on premium California wines and a multi-course gastronomic venture. We were seated at candlelit tables which snaked through a warehouse somewhere in San Francisco. Each season I am privileged to attend numerous long table dinners here in my beloved home at a myriad of venues throughout the Okanagan valley which emulate that first ethereal event. The experience greets me like an old friend that I have been longing to see after emerging from my cocoon beginning Spring and culminating during harvest season in the fall. What are long table dinners you ask? For those unfamiliar with the concept, it is exactly what it sounds like. A multiple course dinner shared with friends (or complete strangers) served at one long communal table. The meals can take place in a rural setting often in the farmers fields themselves, amongst the vines at a local vineyard, or as in the case above in a warehouse. The setting is the catalyst to the exciting prospect of dining on the freshest food possible while supporting the local chefs and farm community in the simplest way possible. By enjoying all they have to offer. Sharing this experience with old and new friends, it simply does not get any better than that!! You can paraphrase a farm to table dinner as 'farm to fork', ' farm to plate', 'earth to table', 'the hundred mile diet', 'locavore' or however your hosts care to entice you. The farm-to-table buzzword is well-established now at restaurants and venues across the country, and many chefs are finding ways to thoroughly integrate the locavore ethic into their kitchens. The farm-to-table movement will open your eyes and delight all your senses when you have the opportunity to experience it (and if it is done well). Each of these experiences are special in their own way. It is about enjoying someone else’s idea of what a good meal should be. We trust that the menu will transport us. We trust that whoever sits next to us, we will at least have good food in common. And from there, things only get better!! We’re not rushed, because the whole evening is devoted to the experience. No one is waiting to take our seats. The emphasis is on enjoying what we’re being treated to, to opening up our minds to new flavours, and to new friends who fast become kindred spirits. I always enjoy myself whether it is with my friends or if I go solo and make new friends. Given the groans, moans, and laughter I think I can say the same for my dinner companions last night who were tending their first experience of what would be an amazing weekend attending the Okanagan Food and Wine Writers Workshop in Kelowna. This workshop is organized by our innovative and fearless leader Jennifer Cockrall-King. Jennifer is a foodie and writer extraordinaire who lives part time on the Naramata Bench in the Okanagan Valley with many prestigious writing gigs and awards under her belt (if I list them all I am sure she would be blushing) as well as several published and soon to be published award-winning books. Over the weekend she will lead the attendees through many learning experiences throughout the 2.5 days of the workshop with energy to spare. She does everything in her power to gather the most creative and knowledgeable speakers...and thrown in for good measure passionate locals and memorable food experiences. Sadly due to work commitments I was unable to join in this year but I know that the participants are in for a memorable weekend. 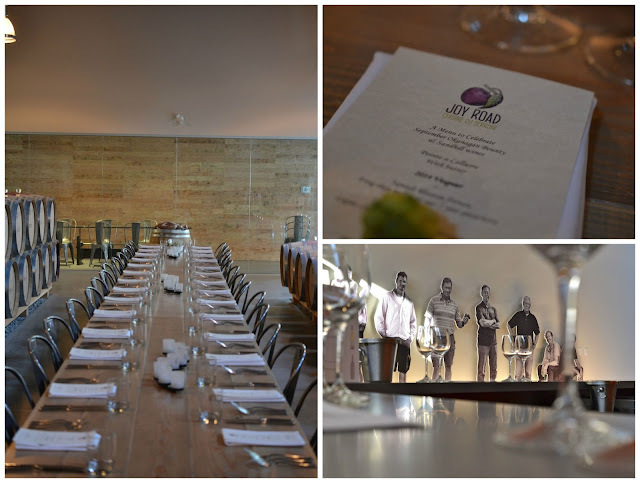 Last night we attended a long table dinner at Sandhill Wines. 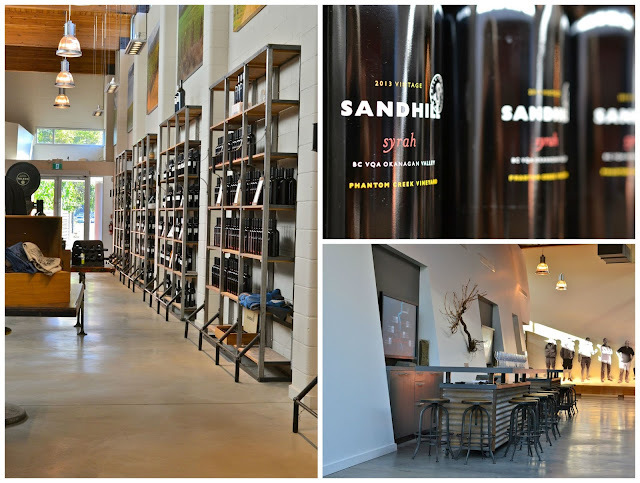 Sandhill is the premium brand produced by Calona Wines, the oldest winery in the Okanagan which was established in 1932 by Cap Capozzi, Giuseppe Ghezzi and WAC Bennett. It opened its newly renovated urban winery in downtown Kelowna where the public can explore the award-winning wines of Master Winemaker Howard Soon. 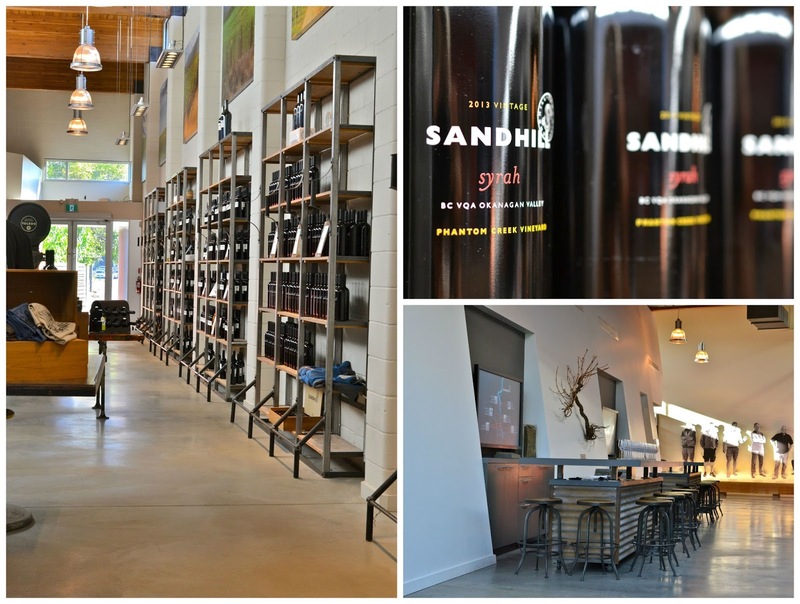 The downtown winery offers wine tastings of the largest portfolio of Sandhill wines including many rare and hard to find lots. Their single vineyard wines are made with grapes grown in individual vineyards in the southern Okanagan. Each of the vineyards including King Family, Phantom Creek, Vanessa Vineyard, Hidden Terrace, and Osprey Ridge as well as 450 acres of Sandhill-owned vineyards wines, are all bottled as single vineyard wines. Most are small lots which are small quantities of wine from specific identified blocks within a vineyard that deliver wines of great character and depth and capture the defining influences of terroir, microclimate and winemaker. These influences harmonize to provide a truly distinct, one-of-a-kind experience we were able to taste in every glass. 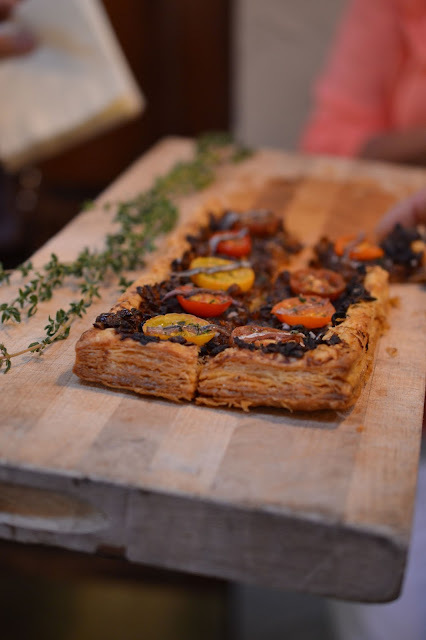 Last night we were taken on a tour of the winery while sipping a beautiful rose and noshing on an heirloom tomato pissaladiere with caramelized onions from our beloved Joy Road Catering. Wandering the venue the design of the winery is inspired by the industrial heritage of its downtown Kelowna neighbourhood. The 8,000 square foot space is modern and light-filled, with soaring ceilings and reclaimed, 80-year-old wood beams. Our culinary hosts for the evening were the talented chefs Dana Ewart and her team of Joy Road Catering who welcomed us with big hugs. As we walked into the venue the stage was set. Close your eyes and envision one long communal table in the barrel room at the architecturally stunning Sandhill Wines; the long wooden table topped with sparkling crystal were soon to be filled with premium Sandhill Wines. Our senses were heightened and we were more than ready for a highly anticipated evening. Candles flickered amongst the white plates and silverware with the barrel room creating the backdrop and the workshop attendees creating the muse. It created a kaleidoscope show of colour in the fading light as the evening loomed before us with the wines of Sandhill competing for the centre of attention. This was followed by platters served family style groaning with the edible bounty of the region. 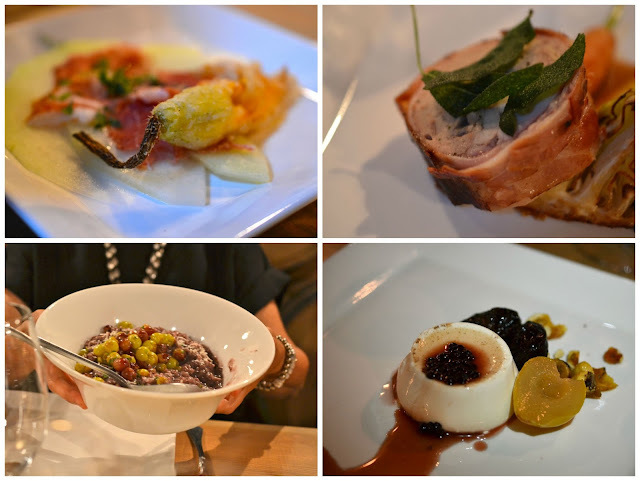 Our plates were piled high with Lapin Cooked in Organic Hay Browned Butter with Sage, Bacon, Carrots and Cabbage; Roasted Grape Risotto with Parmesan and Thyme; Whole Stuffed Trout with Hop Salt Cooked over Dead Sage; and Leeks Vinaigrette with Anchovies and Eggs. And for dessert (since this is a food blog and it is all about food),Wild Elderberry and Anise Panna Cotta with Hazelnut Praline, Poached Butter Bottom Pears, and Joy Road House Made Prunes...Sigh…. A long table dinner is one of the experiences every serious diner, and every diner who visits the valley should experience. A weekend spent at the Okanagan Food and Wine Writers Workshop with world-class writers, foodies and local producers and winemakers is definitely a must. What an absolutely fabulous experience Val. I know my husband and I would both love these dinners. I only wish that they were held near us. And that gorgeous, flaky pissaladiere makes me want to reach into the screen and grab it. Beautiful place and fabulous food! What a joy this is. We need to have an event like this in my neck of the woods. Maybe I should start one? ;-) It's funny, I would find a night where I can sit at a table with all kinds of new people to be a really fun experience, but my husband would consider it a nightmare. Would you call it a mixed marriage of introvert/extrovert or foodie/non-foodie. What a wonderful experience, Val. The menu sounds fantastic.